Humpback whales are renowned for their ability to produce songs of remarkable beauty, complexity, and duration. But despite decades of research, scientists still aren't sure why these whales engage in such elaborate acoustic displays. Here's what we know — and have yet to learn — about the humpback whale's song. The first recordings of the humpback whales were made in the early 1950s. Researchers based out of Oahu, Hawaii, did so by using U.S. Navy "hydrophones" developed for submarine warfare. But without visual evidence, these early recordings couldn't be conclusively attributed to humpback whales. Between 1953 and 1964, Bermudian Frank Watlington used a hydrophone to track Russian submarines. His location in the Atlantic situated him perfectly for recording whale songs; humpback whales seasonally migrate south during the the winter and then head back north in the spring. His recordings, along with those taken a few years later, were used in the seminal 1971 study by Roger Payne and Scott McVay that finally pinned these remarkable sounds to humpback whales. Due to the excellent clarity of these recordings, Payne and McVay were able to perform spectrographic analyses on the sounds. What's more, the researchers were able to correlate aspects of the recordings with the visible behaviors of humpback whales. Much work has been done since the Payne and McVay study, especially in the past five years. Scientists have learned much, but they still haven't been able to definitely nail down their purpose. Here's what we do know about whale songs — and how human activity is causing humpbacks considerable problems. As far back as the Payne and McVay study, marine biologists have analyzed whale songs by breaking them down into components. The basic element of these acoustic displays are referred to as a single "unit," which is defined by marine biologists as the shortest sounds that still seem continuous to the human listener. These sounds are comprised of wails, moans, and shrieks. Six to eight units form "phrases." Phrases are repeated for minutes, forming a "theme," and themes are repeated a few times, forming a whale song. Songs typically last anywhere from 7 to 30 minutes and they vary in aspects of composition (an extra unit or phrase here or there) but are overall similar across multiple renditions of the same song. Songs are generally repeated over and over to form a "session," which can last for more than 20 hours. If one interprets the level-like progression from phrase to theme to song to session as a form of syntax, it forms the basis of what is described in the literature as a "hierarchical structure" that some argue is suggestive of language (more on this in a bit). "Chorusing" happens when multiple whales sing the same song at the same time, though not necessarily in synchrony with one another. Songs evolve and change over time, particularly during winter migrations, and, to a lesser extent, across ocean basins (more on this in a bit). Also, they produce sounds, or non-songs, that are un-patterned and emitted over the course of the entire year. A number of theories have been put forward to explain the purpose of whale songs. Male humpback whales typically produce songs in their breeding grounds when they're competing with other males for mating opportunities. Consequently, many marine biologists speculate that males use the songs as a form of acoustic display — a kind of musical advertisement — to attract females. If they are truly mating-related, these songs represent one of the most complex acoustic displays in the entire animal kingdom. But female humpbacks, who don't sing, very rarely approach singing males. Scientists have not been able to show how the quality of whale song may contribute to a male's reproductive fitness or its role in sexual selection. Moreover, whale songs don't always happen during the mating season, which suggest other purposes, including ones unrelated to mating. Consequently, scientists have had to come up with other explanations for the songs. Some posit a song may function as a migratory beacon, a way to synchronize estrus in females, or a type of biosonar. Songs may also be a form of male-to-male acoustic display. A 2006 paper by James Darling and colleagues showed that singing males are generally solitary. And if they are not solitary, they are usually accompanied by fellow males. More rarely, they are joined by larger groups containing at least one female. The researchers hypothesize that whale songs allow males to bond and support one another during the mating season. None of this means that whale songs aren't tied to mating displays. Research by Alison Stimpert has yielded important insights into so-called "off season" songs. Her team tagged 10 humpback whales with non-invasive suction-cups to study foraging ecology and acoustic behavior. Records of two whales showed signs of continuous and intense singing, with characteristics similar to what's heard in the mating grounds. These whales also produced songs during deep dives, some at depths of more than 100 meters. One tag even recorded a song during a feeding lunge, which showed that potential mating displays can occur in areas worthy of foraging. "These data show behavioral flexibility as the humpbacks manage competing needs to continue to feed and to prepare for the breeding season during late fall," noted the authors in the study. "This may also signify an ability to engage in breeding activities outside of the traditional, warm water breeding ground locations." The researchers also noticed an unusual amount of social activity during whale song (i.e. other whales' songs entering the recordings, which could only happen if whales were in close proximity to one another). These new results suggest more plasticity in the behaviors of humpback whales than previously assumed, such as the ability to pivot between foraging and singing very quickly. Recently, marine biologists Eduaro Mercado and Stephen Handel have criticized the traditional approach to studying whale songs. Instead, the researchers argue that whale songs reflect the physiological constraints of how humpback whales make their songs, and that it's not some kind of hierarchical, syntactical structure. Humpback whales, for example, do not appear to exhale while singing, and yet their songs are believed to be produced by a phenomenon similar to how humans sing: by air flowing across internal membranes within the respiratory system. In a whale, air could be circulating back and forth between the lungs and another respiratory chamber during 20-minute dives, though this remains speculative. The researchers argue that "ingressive" and "egressive" air movements may produce different sounds. They also posit that the shifting of the oxygen/carbon dioxide ratio (which must occur during a dive) could be changing the resonant frequency of the singing organ, by changing sound velocity in the gas in the organ. Both of these physical constraints might contribute to the periodicity (and variability) commonly observed in whale songs. Compare this reading to a hierarchical interpretation of whale singing (which, you'll recall, involves naming the individual components of a song), in which qualities like periodicity and variability might be linked to some function of syntax, rather than physiology. 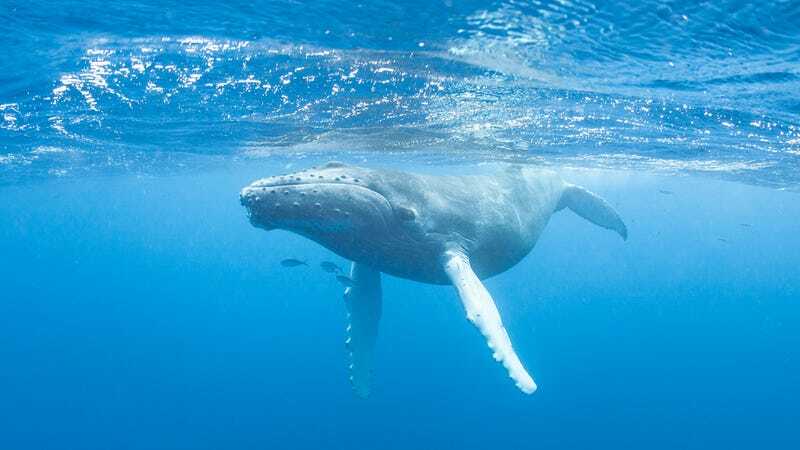 Mercado and Handel's "heterarchical" model could be empirically tested by linking subtleties of whale songs to their behavior, or their breathing patterns. For instance, this model would be well-validated if the scientists could predict the diving or breathing of a whale based on the spectrotemporal nature of its song. Whale songs are constantly evolving within a population. Males tend to stick to the current arrangement of a given song — a conformity that arises from the vocal learning of surrounding males. It's considered an excellent example of horizontal cultural transmission in a nonhuman animal. What's more, elements of songs can be learned by separate populations of whales, which is referred to as cultural transmission. The degree of learning, however, is dependent upon geographic distance between populations. Fascinatingly, the acquisition of new songs or themes may be advantageous for groups of males who want to attract females. These songs could be exchanged from one breeding population to another in one of three possible ways: between breeding seasons, within-season movement of individuals (which would be rare), or shared migration routes and/or on summer feeding grounds in high latitudes. In the Northern Hemisphere, within an ocean basin whales sing songs that are composed of the same themes. However, whales in the southern Indian Ocean are singing almost completely different songs. Songs from Madagascar and Western Australia only shared one similar theme, the rest of the themes were completely different. The reason for this anomaly remains a mystery. It could be the influence of singing whales from other ocean basins, such as the South Pacific or Atlantic, indicating an exchange of individuals between oceans, which is unique to the Southern Hemisphere. Sadly, human activity is screwing up marine life via acoustic pollution. Sources of these sounds include boats, oil rigs, seismic airguns, underwater explosions, construction and pile driving, acoustic deterrent devices, and scientific and military sonar systems.Whales can be influenced by noise as far as 200 km away. It's possible they've had to shift their calls up an entire octave over the past half century, in order to hear one another over the ceaseless din that we produce. Evidence suggests they've also had to make changes to sound duration, volume, sound usage, and repetition. Marine biologists are increasingly worried about the effects of this noise on humpback whales, including potentially lethal injuries such as short- or long-term hearing damage and the disruption of normal behavior, like feeding, mating, and communication. Fascinatingly, immediately after the 9/11 attacks, boat activity was temporarily but significantly diminished in the Atlantic. This allowed researchers to interact with whales off the shores of Maine, who came out in droves, potentially on account of the welcome quiet.